Are we there yet? Have we arrived? Are questions often followed by ‘Is this it’? 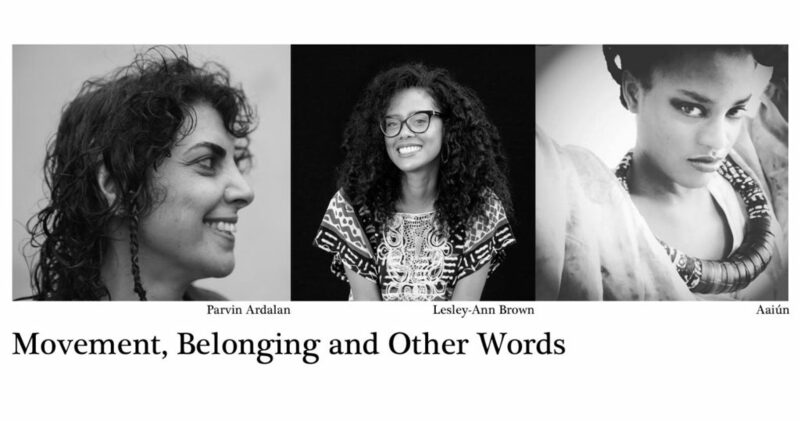 In this event, we focus on movement and the politics of belonging through narrative. We invite to the stage three writers to take us on a journey and to establish the complexity of subjectivity. Instead of assuming a universality of being, the stage becomes a space of interruption, beauty, singularity, frustration and resistance. ‘To be’ becomes an embrace of here and there, and there and here. Aaiún is an Angolan born, mixed media artist and writer currently based in Copenhagen, Denmark. Her work is an examination of pain and trauma in a style that challenges traditional uses of language, visuals and literary boundaries. She writes for those who listen, but especially for black people. Lesley-Ann Brown is a Trinidadian-American author, freelance journalist, activist, poet and teacher who is based in Copenhagen, Denmark. She’s one of the co-founders of Say It Loud, a spoken word-poetry collective, consisting of Black women poets in Copenhagen. Her work explores motherhood, migration, identity, nationhood and how it relates to land, imprisonment, and genocide for Black and Indigenous peoples. Brown’s latest book “Decolonial Daughter: Letters from a Black Woman to her European Son” (Repeater Books, UK) is out now and examines methods of decolonial narratives fused with political activism. Parvin Ardalan is a journalist, feminist activist and writer. She was the editor in chief of feminist websites such as Iranian Feminists Tribune, Zanestan and Change for equality in Iran, where she also co-founded the Women’s Cultural Center and the One Million Signatures Campaign – a grassroots movement aimed at repealing discriminatory laws against women. Ardalan co-initiated Feminist Dialog and the project “Women Making HERstory” (2013-2016), to unveil and re-write the history of immigrant women through 100 years in the city of Malmö. Currently she is the project leader of “Migration Memory Encounters” where the knowledge, experiences and memories of migrants in various cultural fields are being re-discovered and performed in Sweden.